The 20 mile run down to Staniel Cay ended up being a combo of motor sailing and sailing, mostly because the batteries needed a charge, we needed to run the water make and make hot water. Without the water maker our lament would be, “water, water everywhere and n’er a drop to drink.” We get 7 gals/hr and waste 7 gals to flush the system when it finishes, so unless we can run it 3-4 hours minimum, no point in doing so. 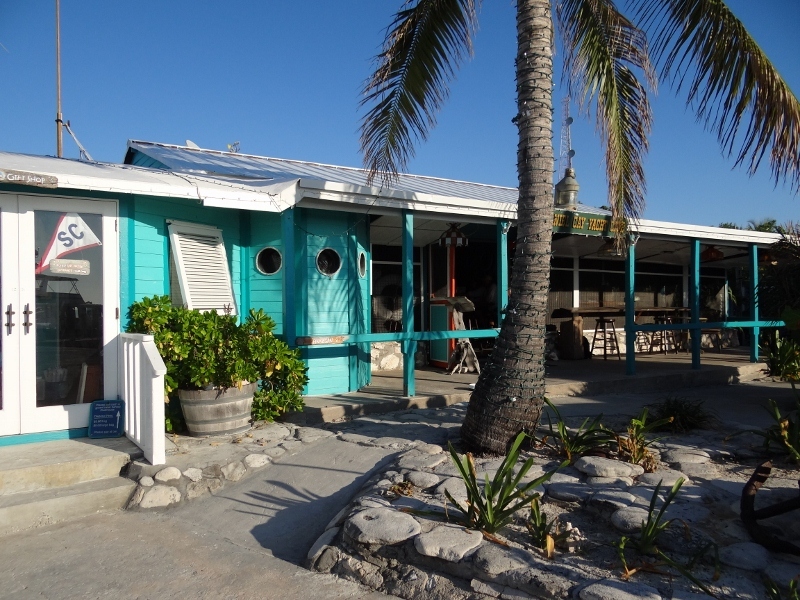 Staniel Cay, like many of the inhabited cays, boasts an airstrip and unlike most it has 3 small food markets, propane refilling and, the best part, the Staniel Cay Yacht Club. Casual and comfortable, everyone welcome. If Jimmy Buffet ranks it in his top 10 places to enjoy a drink you can bet we’ll be visiting. Plus, had the word from several sources that the food was very good. The floundering economy has left its mark very visibly in The Bahamas. Marinas that were meant to be; aren’t. Some are in receivership, others partially built and running on what they’ve got. Worst of all, from a selfish point of view, is that the mail and supply boats (supplies, deliveries- life blood) make their rounds bi-weekly rather than weekly and some three times a month vs four. Our first stop was Isles General Store for groceries, dump garbage ($5) and fill a propane tank. How’d we do? Well… dumped the two garbage bags for $5, picked up some lemons, limes, carrots and eggs (yes! ), but no propane available now. It was a start. We also had the pleasure to meet Joan Mann, a 48 year resident of Staniel Cay and a talented painter. Her painted, island-funky white fabric was sold in the YC’s gift shop and adorned the tables in the dining area. She told us of a workshop happening this weekend that would be led by an artist from Chester, CT. Not small; tiny world. Next, dinghied to the yacht club docks where we were greeted by several friendly sharks of some type (nurse, maybe) swimming lazily about. 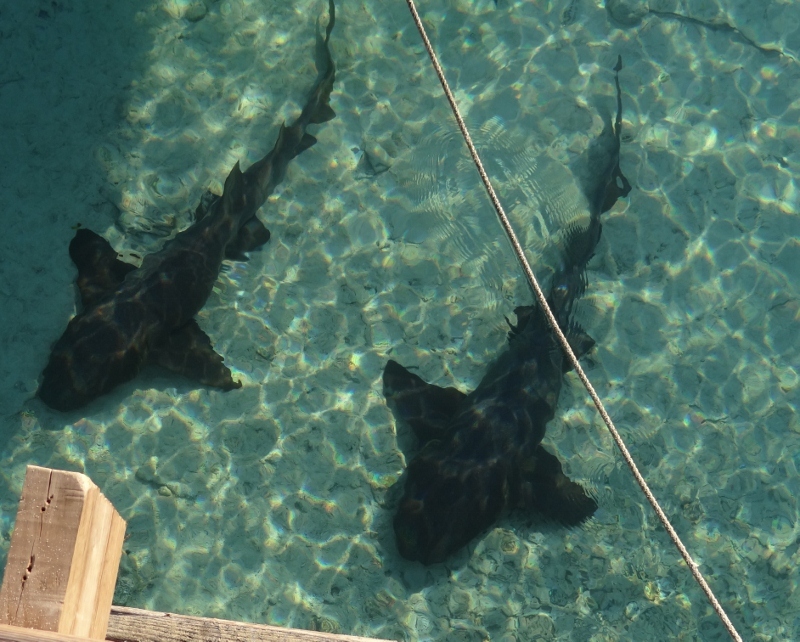 The yacht club has guest cottages and offers fishing and diving trips as well as swim with the sharks so no surprise to see them hangin’ out. After reserving a table for dinner- one 7pm seating, choice of entrée accompanied by two sides, soup, salad and dessert, we walked the streets in search of the pink or blue store and the yellow house for bread. At the blue store, we scored big: two packages of boneless chicken breasts! Nearby was the yellow house where coconut bread was greedily scooped up for $6. This is yeast bread, with a slightly dense texture and off-white in color. Doesn’t have much coconut aroma; we guess that the recipe’s liquid is coconut water/milk. Giddy with our improved provisioning fortunes and thrilled to have yummy French toast to look forward to, even though we couldn’t locate the pink store, we were happy. Part of the 007 movie Thunderball was filmed at Thunderball Cave, a very tiny cay near the yacht club and very close to where we anchored. The interior of the cave is like a small grotto with an opening at the top that allows the sun to shine through, creating a dazzling effect in the water. Best to check it out a slack low tide and be prepared to dive under the small rock at the opening. 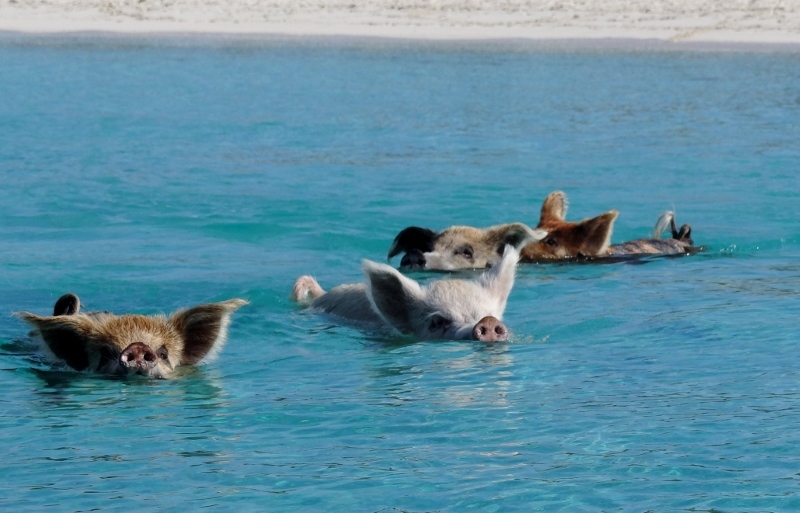 A stone’s throw north-west of Staniel is Big Major’s Spot; home of Pig Beach. This is where the large and hairy “wild” pigs live and will quickly swim out to greet you as you approach the beach. Not really wild, however, they could easily rip a hole in your dinghy. We zoomed over before leaving Friday morning to snap a few photos. Bunting is enjoying a good workout in The Bahamas. When we speed along on plane, the ride is fun and feels great to speed over the beautiful water; often only a few feet deep.